We are a leading Exporter of wire mesh with eyelets for petroleum industry from Thane, India. Working with a belief to make our customers satisfied, we have brought forward a range of Wire Mesh With Eyelets for Petroleum Industry under our product gamut. Taking quality as our prime concern, we maintain the quality of our entire products range and offer the same to our customers. Backed by a team of experts, our Wire Mesh With Eyelets for Petroleum Industry is processed using optimum machinery and advance technology. Furthermore, this product is availed at leading prices and customized packaging. 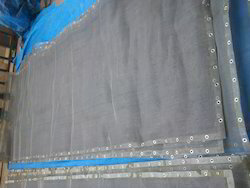 Looking for Wire Mesh With Eyelets for Petroleum Industry ?